Team Oregon busts out the Ws! Eugene roubaix was fun. Its always nice to race on roads I train on all the time, diagnosis and a little weird, it feels a little more relaxed when you see already know every crack in the road thats coming up. The Roubaix had a good turn out and some beautiful weather. 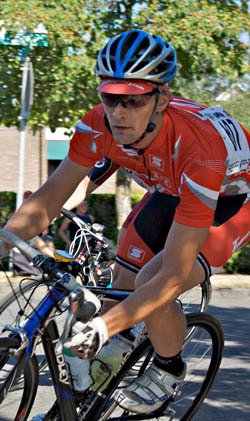 Mark Blackwelder was off the front from the get go, staying out of reach of the surging peloton. There were a few attacks and some moves, but nothing really stuck untill going into the 2nd to last lap, when Rob English made an attack going over the hill. Bannick, Beardsley, Hosmer and myself chased after him and got the gap. At the crest of the next hill on crow we had caught blackwelder and were in a smooth running pace line. That was really the best part of the whole race, that everyone got up the road and started working together immediately. It seems theres a lot of races where things get up the road, but one or two idiots just sit there, or are clogging up the pace line. I hate that. For those that do that, why do you do that? If your just going to sit on, then dont even bother getting of the front, when theres an attack just go to the back of the pack, its a better place for that sort of thing. And dont give me that “Im tired” Business, Blackwelder was off from the getgo, and when we caught up to him he jumped right in and did his share of the work (great ride man). Any ways, so we all worked together to make a fast and smooth pace line, and it was fun. It came down to a sprint in the end and I won. VerNice! That night after the race we drove down to Ashland to stay with Zach Winters at his moms place, where he cooked up some sweet potatoes and chard. It was amazing. We got to sleep in the next day since our race wasn’t until the afternoon, so we took our time in the morning and made a little coffee and pastry stop at a cafe after eating some delicious oats with fruit. The race was WARM. Feels good to finally get out and race in just shorts and bibs. Kennett and I were hoping to go 1,2 in the race, but things didn’t quite work out that way. In order to establish a break one of us was going to have to put down the hammer to string it out and give the other one of us the chance to get away. Since I won the day before, it was my turn to do some damage and start swinging the hammer. I made an attack on a short steep hill counting on some chasing, which happened. Things were strung out nicely and guys were having to breath a little, but this was just the prelude. kennett came up and helped me ride a bit of tempo on the flats before the final pitch where our move was to take place. Going into the short finishing hill I started drilling it again and things were strung out a lot and starting to break apart, then Kennett made the attack near the top, taking Paul Boucier with him. After he made the attack I sat up a bit to help slow down any chasers and get the gap open. It worked perfectly, heading into the descent there was a gap and everyone was too tired to chase hard or get organized immediatly and they were able to maintain the gap and catch the lone rider up the road who rode off earlier in the lap. Kenji and I sat in the pack and blocked a bit, letting Therapeutic Associates do the work on the front. Eventually Kennett and Paul dropped their 3rd accomplice on the final lap, opening up the final podium spot to the field. Kenji did a great job of helping me keep the front controlled so we could make sure to take the field sprint, and keep the time gap good for our man in the break. Meanwhile kennett was riding strong and taking the win off the front. In the final kilometers leading to the finish kenji was keeping me at the front, until it was the final climb when it was time for me to get the job done. Mission accomplished.